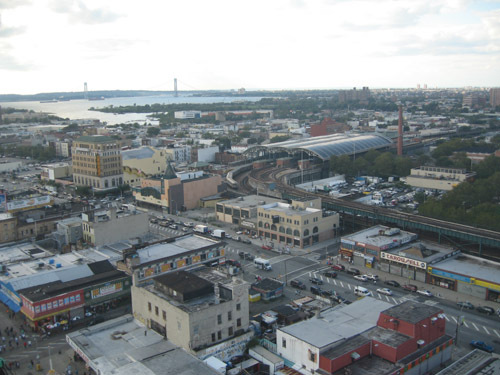 The Gowanus Lounge: Coney Island Death Watch: Is Eviction and Demolition a Bargaining Chip? If you read GL, you know one of the things we keep a close eye on is the pending redevelopment of Coney Island. We have watched as developer Thor Equities, which owns large parcels of land in Coney and has big developments up its sleeve, started evicting tenants. Why? Possibly because a more vacant Coney is one that demands faster public action. The CIDC's plans would depend on the amusements that lined Stillwell Ave. If instead what they ended up with was two massive vacant lots that lined both sides of Stillwell as well as a huge vacant lot on the Southeast corner of Stillwell & Surf, then all their plans would be off. How do you revitalize Coney if what visitors exiting the terminal have to look at is vacant lots? Even if they did develop the land behind Keyspan, would anyone want to walk past vacant lots? And Thor could further devalue the area by tearing down the buildings they own on the boardwalk. We're not convinced that City Hall's economic development operation is going to oppose Thor's plans unless they're utterly objectionable. But it's interesting food for thought if you are trying to understand why a developer would want to create a Coney Island that is even more empty than it is today when, at best, its project is still 1-3 years from breaking ground. (This is New York, after all.) All that emptiness and desolation would definitely work in Thor's favor to apply pressure and speed things up.